"What I'd Teach Your Horse: Training and Re-Training the Basics"
(Step 1 if This Is “Day 2” for Your Young Horse) Your young and very green horse has learned to pack a saddle and you’ve sat on it once or twice—but you’d like to do something more than sit there and wave at your friends as they ride off. You want a horse that... moves. Here’s what to do. Control of your horse’s hips is the key to all the “stuff your horse can do.” Here we start unlocking your horse’s potential with a few basic and easy exercises. Our next objective is to better the horse’s ability to move its hips on request, giving us not just a step or two, but a pivot over his shoulder of a full 180 degrees. The Swiss Army knife of training exercises, use this routine to warm up, cool down, lower your horse’s head, connect the rein to the feet, or to soften laterally. Training your horse to walk, trot or lope in a straight line is easy. Here’s how to do it. Here’s a great primer for all future training: In the same way that you can use a hammer and saw to build a penthouse, doghouse or outhouse, you can use the “Clockwork Exercise” described here to teach your horse almost anything. Beyond teaching simple cues to “turn left” or “turn right,” you can pick the appropriate numbers and teach a spin, a back up, a side pass... the options are endless. How do you know when you know you’ve got no “shoulder control”? Four seconds before your knee hits a tree. Here we get the back half of your horse lined up squarely behind the front half. We’ll fine tune your steering and get the two of you in shape for the more complex work you’ll face when your horse graduates from basic training to graduate school, prepping it for a life as a reiner, eventer—or real cool, pushbutton trail horse. We’ll quickly teach the “reverse arc circle” as an example of how to get more advanced shoulder movement using “clock work.” “Reverse Arc Circle” is a fancy way of saying “your horse looks off to one side, but pivots on his back foot going the other way,” (he looks left, spins right). It’s a first step to teaching the reining spin or neck reining. If your horse leans over or “drops a shoulder” in a turn, here’s how to fix it. Presently, your horse knows just two speeds: “Slow” going away from the barn and “fast” going toward it. Here we teach it to slow down and speed up when lightly cued—but also to travel consistently at a wide range of speeds. If you have problems with your horse getting “higher and higher”—or need ways to slow a fast one down—then the following two sections are for you. When you want to teach your horse to slow down, a simple key is to find a moment when traveling on a loose rein and build on it. Forcing your horse across obstacles without proper training is inviting trouble. Here’s how to properly prepare your horse to walk across scary objects like tarps and water and to avoid fights. It’s also great pre-training for teaching your horse to load into a trailer. If you’ve practiced the “Clockwork Exercise,” specifically and successfully teaching your horse to step on “6 o’clock” repeatedly, then your horse can and will back up for you today. What we’ll do here then is work to make the movement smoother and quicker. We’ll use what you learned in the Clockwork Exercise to firmly ingrain in your brain the importance of being specific with your requests—and we’ll see how that precision can be used to turn on a dime and ride circles that don’t look like eggs. Get your horse giving to the bit, dropping its head and rounding its body, rather than bracing when you pick up the reins. Being “rounded” is the crux of collection. Collection gives us a horse that can readily follow our requests with lightness and precision with zero hesitation. Q: “How do I fix cross-firing in the lope? How do I even know when it’s happening? Teaching your horse to neck rein is simple—and here’s how. It is critical that you become practiced with your hands, your primary source of communication. This is—in detail—how to pick up, handle, and release your reins. Two days from now your friends at the barn will be pointing at you excitedly, stepping from your path reverently and cooing “oooh” as they watch you ride. Just as another person might reach out a hand to shake yours as you approach, a trained horse will proactively read your body language and act, never waiting for a tug on the reins. Is your horse getting duller to your cues? Do you make a request only to have him shoot you a condescending glance and go back to what he was doing? It might be that you’re burning out your cues when you use them as both a “heads-up” and motivator. If you’re guilty of being a bit heavy-handed (as evidenced by a stiff-as-a-statue horse) here’s a Top Five training concept that will soften your horse very quickly. Here find six horse training tips, each designed to simplify your training and make big changes fast. Here are 3 “Rider Checklists.” Together, they’ll keep you safer—and accelerate your training to boot. 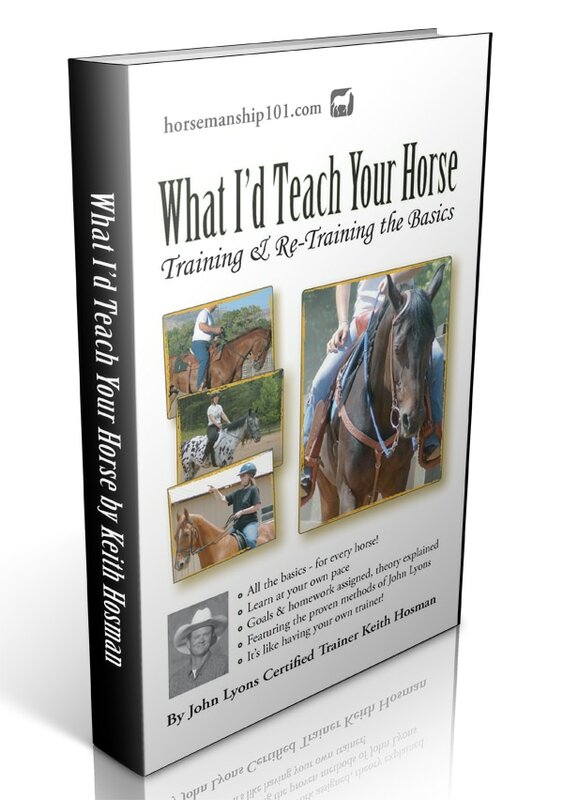 Click here to hear "Clockwork (How to Teach Anything to Your Horse)," an entire chapter from the book "What I'd Teach Your Horse." 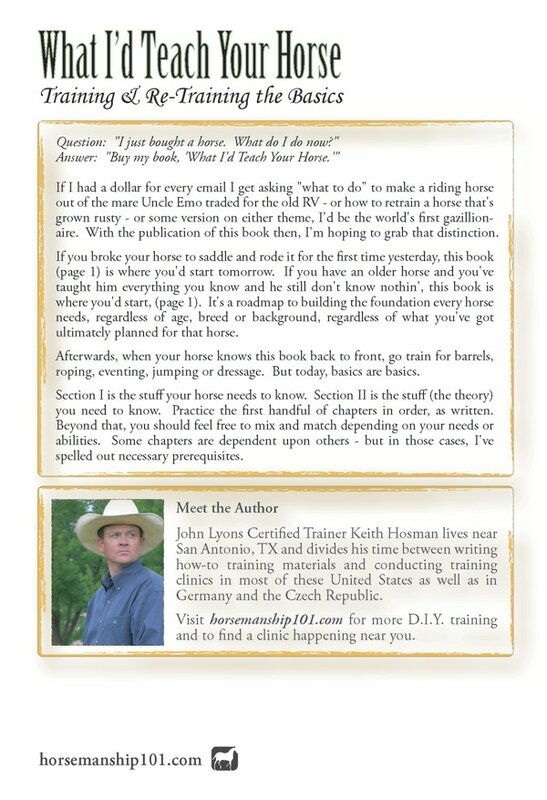 ​If you broke your horse to saddle and rode it for the first time today, this book is where you'd start tomorrow. Likewise, if you have an older horse that needs re-training, you'd start here. This book is a roadmap to building the foundation every horse needs, regardless of age, breed or background, regardless the type of riding for which it will eventually be used. If you broke your horse to saddle and rode it for the first time today, this book is where you'd start tomorrow. Likewise, if you have an older horse that needs re-training, you'd start here. ​This book is a roadmap to building the foundation every horse needs, regardless of age, breed or background, regardless the type of riding for which it will eventually be used.